Don Cherry and Ron MacLean bring you another rendition of Coach's Corner and recap the first round of the NHL playoffs and shed light on Nazem Kadri's future. Plus a few more topics. Broadcast team for Boston/Columbus will be Mike “Doc” Emrick, Mike Milbury and Brian Boucher on NBCSN and on Sportsnet play-by-play: Jim Hughson; game analyst: Craig Simpson; reporter: Kyle Bukauskas. For Dallas/St. Louis we will have Brendan Burke, AJ Mleczko, Pierre McGuire for both the USA and Canada. John Tortorella talks about shocking the NHL world by beating the Tampa Bay Lightning and how a wild regular season prepared the Columbus Blue Jackets for the NHL playoffs. The Babcock situation is not the first priority on Dubas’ busy summer schedule, but it is a priority of some kind. While the assumption is Babcock will return as head coach, there may be some staff changes or internal alterations to aid coaching in the future — and some conversations about how Babcock can move forward as a coach. Dubas won’t say it out loud, but he couldn’t have been happy with Babcock’s playoff performance, as many weren’t. When asked a question about it at the Leafs’ wrap-up yesterday, he did his own version of the two-step. His answer was not at all direct. Dubas, himself, took the blame for the Leafs’ loss in Game 7, took the blame for the Leafs’ lousy penalty-killing in the playoffs, pointed fingers at himself rather than anyone else. 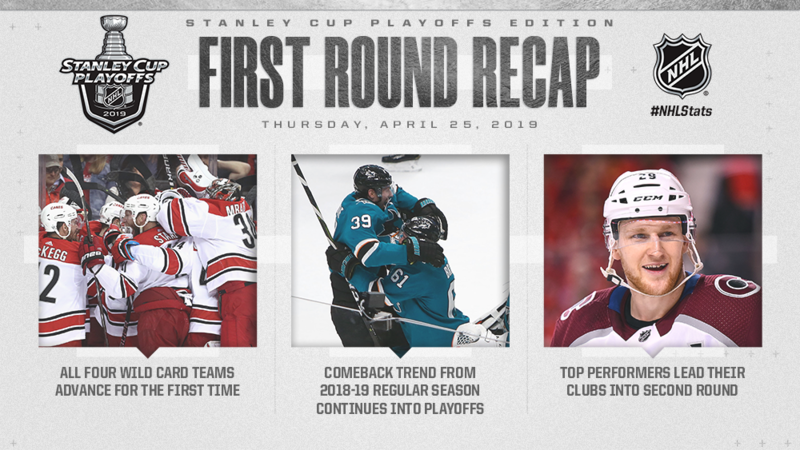 STAMFORD, Conn. – April 25, 2019 – On the strength of 10 overtime games, three Game 7s and two improbable sweeps, NBC Sports’ presentation of the 2019 Stanley Cup Playoffs across the networks of NBCUniversal delivered the most-watched First Round in seven years, according to Nielsen and digital data from Adobe Analytics. First Round coverage across NBC Sports’ cable platforms produced the most-watched First Round on cable in 25 years and ranks as the second-best First Round on cable on record (since 1994). The First Round milestones were punctuated by three Game 7s, including last night’s Hurricanes-Capitals series finale on NBCSN, which is now the most-watched First Round cable game on record. Team with home ice advantage listed first. Games start tomorrow so get your picks in before 7:00pm ET on Thursday. Check out how you did in round 1. Nazem Kadri discusses the hit that led to his suspension, and his accountability, and how he was just trying to do the right thing, and ended doing the wrong thing, and ensures that it will never happen again. Mic'd up first, NHL weirdness from the past week is below.